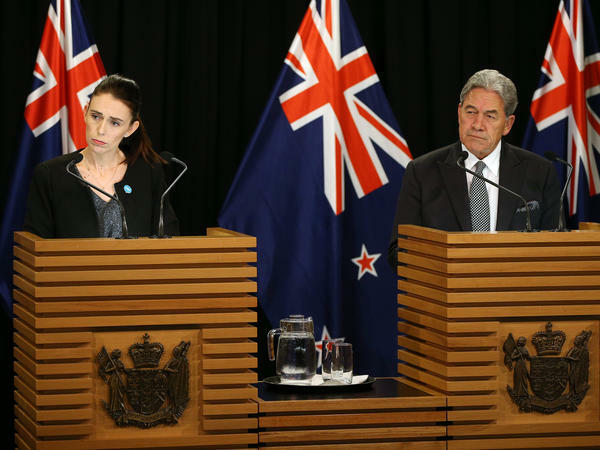 Prime Minister Jacinda Ardern and Deputy Prime Minister Winston Peters speak to media during a press conference at Parliament on Monday. The attacks on two mosques in Christchurch, which left 50 people dead, "has exposed a range of weaknesses in New Zealand's gun laws," Ardern said. "The clear lesson from history around the world is that to make our community safer the time to act is now." New Zealand's quick move to reform gun laws in the aftermath of a mass shooting lies in stark contrast to the typical response in the United States, where many lawmakers resist immediate calls for tighter gun laws, accusing activists of politicizing a tragedy. Ardern promised to share details of further gun restrictions over the next week, but the new rules will likely focus on semi-automatic weapons. "I think what the public rightly are asking is why is it, and how is it, that you [are] currently able to buy semi-automatic military style weapons in New Zealand," Ardern said. "And that's the right question to ask." According to NPR's Julie McCarthy, the New Zealand retailer "Gun City" sold the alleged shooter four A-category firearms and ammunition. McCarthy reports that the semi-automatic weapon used in the shooting is believed to have been modified to increase firepower. It's unclear how the country, which maintains a relatively high rate of gun ownership, will react to the proposed changes. Ardern acknowledged the potential jitters the new laws might cause for some gun owners there, "including those who possess guns for legitimate reasons," especially in rural areas, she said. "I want to assure you that the work that we are doing is not directed at you. In fact, I strongly believe that the vast majority of gun owners in New Zealand will agree with the sentiment that change needs to occur." In comparison, most gun purchases in New Zealand are not tracked, the New York Times reported. "New Zealand is almost alone with the United States in not registering 96 percent of its firearms," Philip Alpers of GunPolicy.org told the Times. Though estimates vary, the country of 4.6 million likely has somewhere in the range of 1.2 million to 1.5 million guns. At the high end, that means there's one gun for every three people. But it's impossible to know for sure, because New Zealand lacks a nationwide gun registry. "We have a tough licensing system, but we lack the register that Australia has," security expert John Battersby told the Australian Broadcasting Corporation. "We actually probably don't know how many legal firearms there are in New Zealand and we certainly don't know how many illegal firearms there are."